It’s no secret that we love the G-Force from Gorbel. This piece of technology has been an industry game-changer for the material handling industry. With its ease of use – particularly with programmable loads – it’s intuitive and fast operation, and simple to use controls, operators can become advanced users within minutes. It’s one of those pieces of equipment that becomes so natural to your process that you wonder how you operated without it. It’s hard to describe how intuitive it is unless you compare it to other equipment. It may be a cliché but once it’s a part of your operation you’ll wonder how your lifting processes operated without a G-Force. 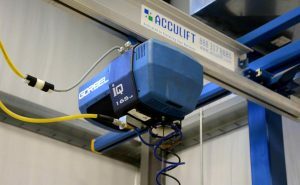 A complete intelligent lifting system consists of an articulating jib crane, an IQ G-Force hoist and the force sensing handle with an end effector-specific to your load. 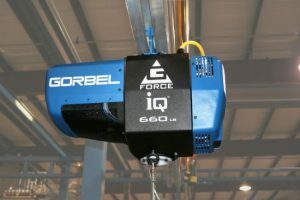 Which is another great advantage of the G-Force – it works equally well with different end effectors – magnets, clamps, or vacuum lifters. The G-Force can also be used on overhead cranes or standard jib cranes, where ever you have a hoist, you should consider if the G-Force would be a better fit for your handling needs. Ease of use. Gorbel has definitely created a device that is intuitive yet powerful. Within minutes your operators will be using the G-Force like a seasoned pro – it’s that intuitive. Float mode. This could be called dream mode, it’s that nice. This feature allows you to move the load with finger tip force (10 psi) with the load moving gently where ever you position it with minimal force. This is great for positioning heavy loads precisely (as required in installations or hanging of loads). Continual Servo. 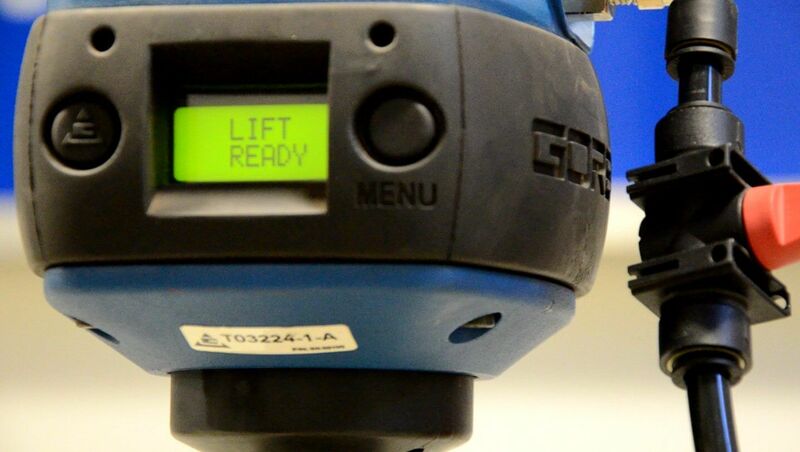 With an always on servo motor the G-Force doesn’t turn on and off like chain hoists so it will last longer if your tasks require you to move and reposition loads often. E-Stop Feature. 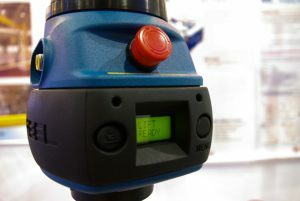 If you need to immediately stop a lift, the large red button on the front will do that for you and prevent further lifting until a user starts up the system again. Programmable loads. If your production line has various components of different weights you can program the G-Force to each load weight quickly and easily to adjust to the load. Virtual Limits. The G-Force is programmable to slow down or stop at ends of movement. This means you can quickly bring a load to where you need it then the lift speed decreases for precise placement of the load. Also, you can restrict the height that the operator will be able to raise the load preventing overhead or straining motions. Speed. If you are loading materials rapidly, the G-Force is right there with your operator. As fast as they can work, the G-Force can provide the lift. For rapid production lines, the G-Force is your best bet for speedy, consistent load handling. We asked our sales and service staff to step up and demonstrate what they like about the G-Force. Here’s our crew in action demonstrating some of the top features of the G-Force. Need more convincing? Here is the complete run through of the G-Force’s features and operations. A handy training video for your staff to watch to learn all of the benefits of an intelligent lifting system in the workplace. How would you use the G-Force? Here is an application of the G-Force with a unique task specific end effector. Again, the G-Force works great with a wide variety of lifting mechanisms and is suitable for many industrial lifting applications. Contact us to discuss your specific needs and we’ll see if this solution is YOUR solution.